Owner and operations manager John Schmidt (who co-founded the Taco del Mar chain with his brother and business partner, James) has made it his business to turn the tables by pleasing the masses with American-food favorites. 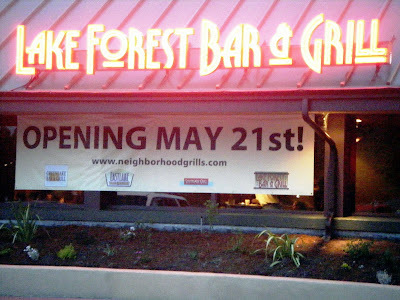 These days the menus at his Greenlake Bar & Grill, Eastlake Bar & Grill and Southlake Grill are replicated throughout the company stores including here at Lake Forest Park Towne Centre. 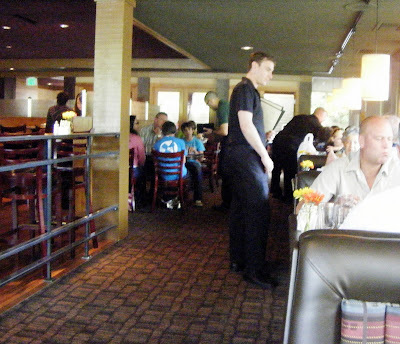 Doing so has offered consistency for customers who dine at any or all of them, John says. What’s more, it gives the company greater purchasing power and makes it easier to train staff so he can “plug and play” them as needed. Our savvy, smiling (and admittedly exhausted) waiter, late of the Eastlake Bar & Grill, told us he was pleased to be working closer to home in Lake Forest Park. His boss made it clear he was also happy to be where “there’s a real strong community spirit” — and an eye-popping number of potential customers living in homes nearby. They’ve quickly proved to be the kind of community in need of a place where a moderately priced menu and something to wet their whistle holds a certain appeal. On offer? 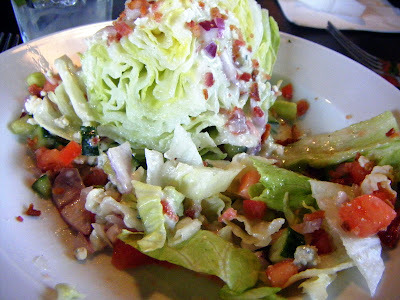 Fish ‘n chips, prime rib dip, pasta-, steak-, and seafood mains and the kind of salads (Caesar, spinach, wedge) that can be dressed with chicken breast. Two daily happy hours plus weekly promos like “Steak Night” (when $5 buys a 6-ounce steak with fries) seal the deal, and weekend breakfast starts June 6. 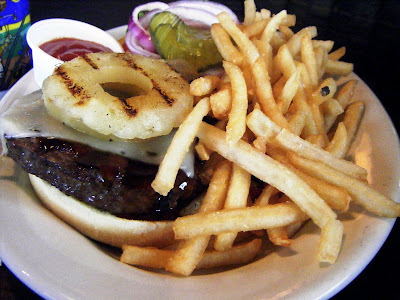 “That’s one juicy teriyaki burger,” says Nate, who’s fond of grilled pineapple, and fries. I wedged this in between buffalo wings and a bite or two of that burger. It took over a year to secure the lease on the former Coco’s restaurant space, but the build-out went swiftly thereafter, the owner explained. Inside you’ll find a horseshoe-shaped bar up front and a semi-private dining area in the rear off the main dining room — 170 seats in all. The bar’s quiet now, but it won’t be for long. 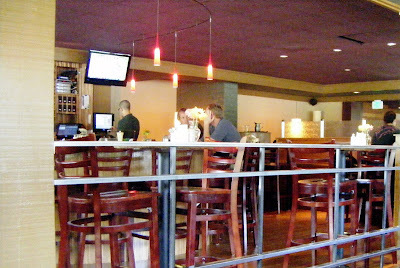 The view looking north, from a comfortable booth near the bar.